With the holidays looming, this may seem like an odd time to be planning your outdoor kitchen. In fact, it’s the perfect time to do so! Starting an outdoor project now means it will be finished by the time the warm weather rolls around again—and you’ll have the whole summer to enjoy the fruits of your labors. Prepare your outdoor spaces for spring and summer early—especially if you enjoy being outdoors with your friends and family. Cooking (and eating, too!) is one of the most enjoyable activities to do in a patio space. 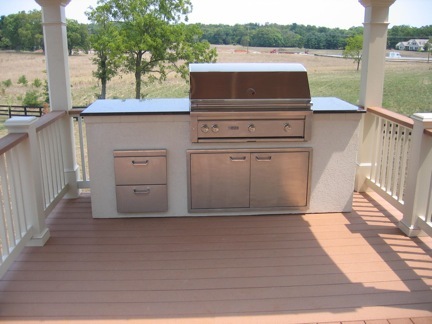 Many homeowners today are replacing portable grills with fully equipped outdoor kitchens. This is a direct reflection of people’s interest in maximizing their usable living space, including their outdoor spaces. Whether the goal is to entertain guests or to have a place to cook and eat outdoors after a long day in the office, an outdoor kitchen can provide all the conveniences of cooking inside, while allowing you to enjoy the beauty of your landscape. 1) Where do you plan on spending most of your time while you are outdoors? 2) How do you plan on using the outdoor kitchen? If you plan on spending much of your time on the deck or patio right off the back of your home, are you close to the main kitchen? If so, you may only need the basics such as the grill and drawers, or what we refer to as a grill island. If you plan on using the grill mainly to cook for yourself and your family this is also a good option. Food and beverages can easily be transported from the indoor kitchen, and clean-up is easy with small parties. If you plan on spending most of your time down by the pool or plan on entertaining on a regular basis it would make more sense to have all the mainstays of your kitchen. In this circumstance a client’s wish list often includes a grill, side burner, drawers, built-in trash receptacle, sinks and refrigerator. With all these amenities, everything from preparation to clean-up can be done outdoors, allowing you to spend more time with your guests. Maybe you want to keep the entire party outdoors with a wide variety of amenities, or you are looking for an outdoor entertaining area that can be used in any season. There are outdoor features and appliances to meet any desire. Smokers add wonderful flavors to all types of meat and fish by utilizing a slow, cool-smoke cooking process. This also frees up the grill for cooking vegetables and side dishes. Side burners and warming drawers are other increasingly popular features that allow the entire meal to be made outdoors. Wine coolers, ice makers, and even dishwashers provide all the luxuries of indoors, while a fireplace or fire pit make your outdoor kitchen area usable year round. 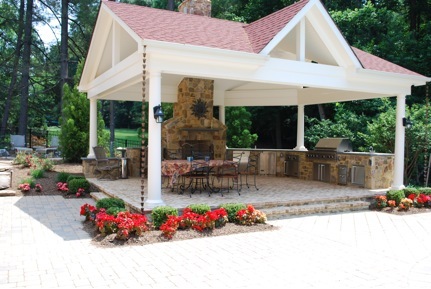 Remember to work with experienced contractors when designing and installing an outdoor kitchen. Plumbing, electric, and either propane or natural gas will need to be installed by a professional. It is important to obtain all the required permits to ensure your safety and to make sure your investment does not come into question when you sell your house or have other work done where a permit is required. Also, make sure your contractor uses quality outdoor appliances such as Viking, Wolfe or Kalamazoo. These appliances are made to withstand the harsh environment and are therefore usually more expensive than their indoor counterparts. It is important to choose what you will need, but it is not necessary to get everything you have inside.